Set within 16 acres of Surrey countryside, surrounded by lawns, a garden terrace and located at the end of a magnificent driveway framed by oak trees, a wedding celebration hosted here is certain to provide you and your guests with wonderful memories. As a recommended supplier, I shoot there regularly and it’s always a joy to return to such a fantastic venue with endless photographic opportunities. This elegant 19th Century Victorian stately home is a perfect combination of the traditional historic splendour of its era and modern day luxury, convenient to London and the M25 whilst standing resplendent within a tranquil environment of natural beauty. Hartsfield Manor evokes dreams of a perfect romantic fairy tale wedding and then converts them into a reality – the ideal landscape for stunning photography of a memorable day. 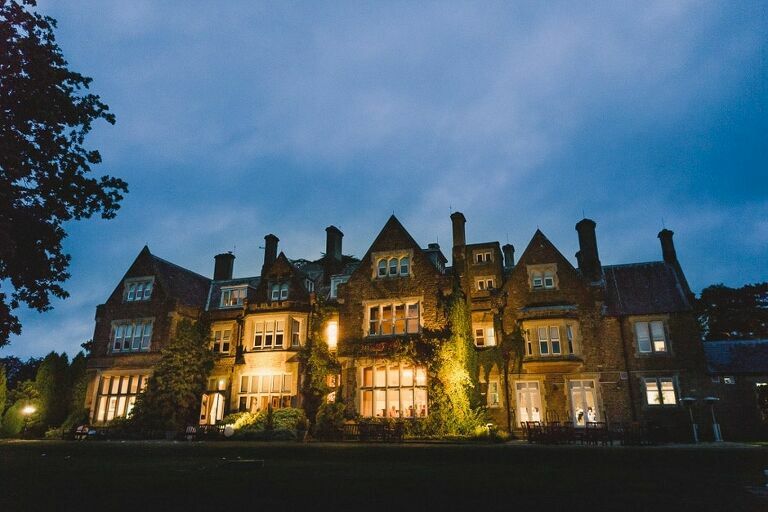 Hartsfield Manor was originally built as a family residence in the 1860s and over the years has had an interesting history as a hospital, hotel and even a training college for the Midland Bank. Its current owners have recently refurbished the building, and its imposing stone arch entrance creates an elegant welcome to this beautiful wedding venue. Once inside, the magic continues with a majestic sweeping staircase, stained glass windows, plush red carpeting and periodic furniture. This venue is licensed to stage civil ceremonies for up to 90 guests and can easily cater for up to 120 for receptions. Choose between the romantic charm of the Brockham Room, which features classic cream décor, a feature fireplace and breath taking views of the gardens and countryside, or for larger weddings the spacious lounge with its high ceilings, ornate mirrors, chandeliers and elegance. For drinks and wedding breakfasts the picturesque setting of the Terrace Restaurant is an ideal location to capture exquisite photographs among the beautiful garden lawns. The hotel prides itself on its catering and hospitality with a team of experienced chefs available to create tailor made menus, complete with fine wines and Champagnes. Whether you’re looking for a wedding breakfast, a three course meal or a simple buffet, the team will cater for all tastes and preferences with a wide selection of freshly sourced produce and ingredients. For an extra special touch, exclusive hire of the venue for your special day allows you to truly be Lord and Lady of the Manor. A red carpet arrival, bridal dressing room, ceremony room decorated to your choice of colour theme, champagne toast with a Master of Ceremonies together with bespoke menu and use of the honeymoon suite are certain to add extra romantic sparkle to your perfect day. The hotel also offers a selection of 50 cosy bedrooms complete with en suite facilities. Many of these rooms maintain the stylish and sophisticated traditional Victorian décor and incorporate mahogany furniture, modern luxury bedding, relaxing lighting and flat screen televisions. This not only provides convenient accommodation for your wedding guests but gives them a unique opportunity to sample all the facilities on offer within this beautiful venue and also enjoy the beautiful Surrey countryside location. For that magical fairy tale wedding venue, Hartsfield Manor provides a perfect escape for your special day. Address: Sandy Ln, Betchworth RH3 7AA. If you’d like to enquire about my availability for Hartsfield Manor please get in touch here.